January $150 Paypal Cash Giveaway! →January $150 Paypal Cash Giveaway! However, this month, my friend Kharim Tomlinson of WebMaster-Success is doing his first cash giveaway of the year. So I thought that will be a great opportunity for you to jump in and stand a chance to be one of the winners. 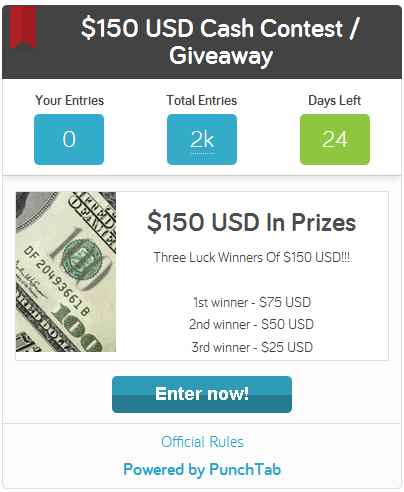 Each click on your unique link gives you 1 giveaway point and any entry that comes through your link gives you 5 giveaway points. The more the points, the more your chances to win. So do your best sharing your link to stand a better chance to win. On the punchtab widget above, you are shown your progress under “Your Entries”. Really Hoping To Win This Giveaway! Admin Nice Giveaway! Hey Sunny, your last sentence cracked me up…but jokes aside, Enstine is making cool money online! So he should actually look his reality – don’t you think so? Enstine Muki recently posted…Business letter that keeps Advertiser panting for my blog! Nothing that is worthwhile is easy, Enstine…I really appreciate your determinination and hardwork: only these two things are really omnipotent in any attempt to achieve success, both in life and business. This is a great give away. Would love to have that $150 in my paypal account. Just taking part and hope to win. Thanks Enstine. It’s so kind of you to think of still co-sponsoring a giveaway even in the event of your PayPal challenge. I must say I am quite impressed with the spirit and you’ve got yourself a new fan! I wish that your Paypal challenge is resolved fast enough…you certainly deserve the $$ that is supposed to be coming in! Your country is delisted as a whole? oouch, that’s quite bad…if you need help to move on, shoot me a mail and I shall offer you one or two tips to get things moving again. Or in the alternative, go the Payoneer way! At least, Payoneer is known to be neutral and very fair across board. I use Payoneer (in conjunction with their US Payment Service) too. And I agree with you that while their service is great, many of our clients (and sponsors) are simply too used to Paypal to consider another option! I have dropped you a mail. Your reply would help me work out a solution. Your new blog is really awesome. Its improved to high quality in no time. I am highly hoping and working to WIN IT.. I want the cash prize to buy a Tablet since i am saving money for it. If i get this one, i can surely buy. Fingerscrossed.. Awesome giveaway, i hope i win the first prize lolz. Its nice you sharing such giveaway with us. Looking forward for more in the future. Have a fantastic week and best of luck to everyone! I’ve followed everything, hope I win this giveaway. Thanks. Am looking forward to winning this. Thanks for this Good Giveaway. I registered to this hope i win this giveaway. Your new blog is really awesome and its really improved in a quality in no time. So finally a great giveaway! Seems like I’m bit late here but will surely join the giveaway now. Hope to be a lucky winner. looks am a bit late on this giveaway, Am surely gonna deep my fingers on this. Nice one and I think that I will participate. Not much chances, but would give a try. Oh wow, very wonderful giveaway I must say. I’m really impressed by seeing the cash giveaway. I am sorry to miss this Giveaway because I joined you blog later on but now when you will give us this opportunity and I hope this I will win giveaway. I am so happy when some one give this type of opportunity.